John Daly is competing for team USA, but it's not brash golfer most Americans know. This John Daly is a 32-year-old skeleton racer hoping to snag a spot on the podium. Olympics Primetime Primer: Thursday, February 15th. However, the confusion did prompt the golfing John Daly to have a little fun on Twitter. 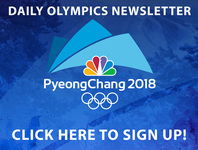 Then, that prompted NBC Olympics to post a picture Americans will have a hard time removing from their brains. The good news for the skeleton racing Daly, win or lose, he'll have a pretty sweet reward when he comes back to the states.